1. Check initial calibration. If the controller has been changed, or the offset adjusted after the sensor has been installed, the temperature reading may be very different from the actual temperature. 2. Check the sensor lens. If dirt has accumulated on the lens over time, then the reading may be lower than expected. Clean the lens using a Q-tip and alcohol. The lens needs to be treated gently, it can be easily scratched. 3. If the sensor reading does not change even thought the target temperature is changing, the sensor may be burnt out. Check the impedance of the sensor, if the impedance is >15kohm, then the sensor is probably burnt out. If the impedance is <100ohm, then there is a short in the thermocouple wire and the temperature being measured is at the short. 4. If the temperature suddenly reads about half of what it should, then the hermetic seal may be compromised and the Xenon gas may have escaped. 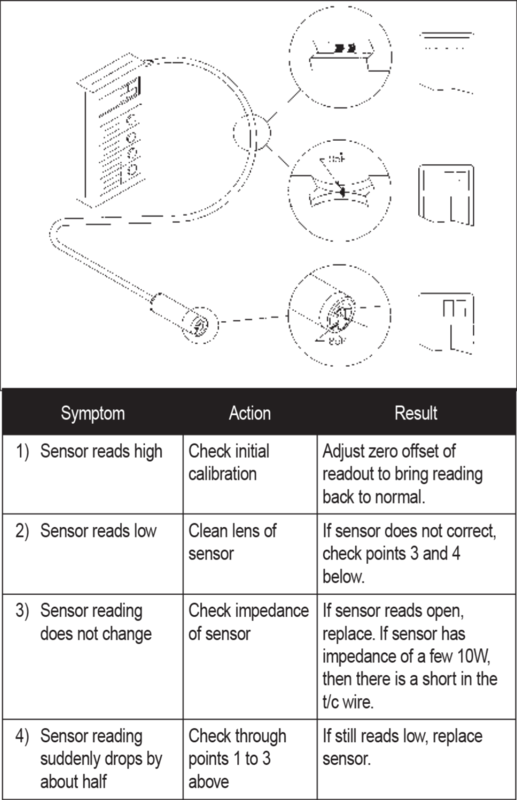 For more information regarding the calibration testing of IRt/c sensors, see Tech Note #74. For process control applications, the system can be programmed to check the sensor circuit every time it is powered up, see Tech Note #39. If a PLC is used for process control, a sensor short will have the same effect as a “Heater Burn Out Protection” feature.